Canongate Press, Edinburgh, 2000, 5th printing. Etta James, Johnny Otis, Whitney Houston, and of course, Gil Scott Heron all died recently within days, weeks of each other, With the exception of Johnny Otis, all were Black Americans who had suffered from varying degrees of drug dependency. In those days that situation was not considered to be other than a low-life depravity. Nowadays drug addiction is recognized by many medical experts to be a serious illness. The courts and penal systems disagree and as a result millions of Black and brown folks are incarcerated for drug offenses. This policy indeed has a huge impact on the communities to which enforcement of this attitude has had disastrous outcomes. Etta James and Gil Scott-Heron suffered through prison stints because of their addictions. Whitney Houston suffered through public media abuse. Who is to say what was worse? Given the obvious sensitive natures of these artists it could not be said that they survived their punishments. 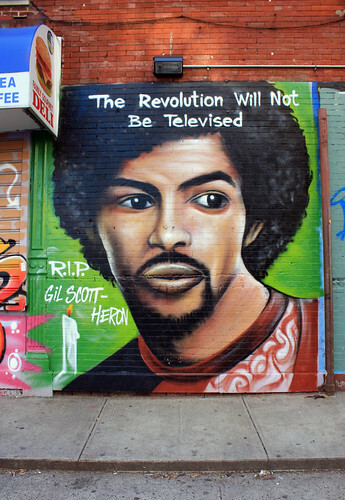 For Gil Scott-Heron a controversial piece in the New Yorker magazine in 2011 presaged his demise. While it was certainly not (one would hazard) the goal of the writer of the piece to have his subject die soon afterwards, I charge that the obvious focus of this sensitively self-portrayed writer from the “establishment” point-of-view publication and personage, was so ignorant of the joie de vivre of his subject that he not only missed the point, but contributed to Gil Scott-Heron’s demise through either sheer ignorance or pointed vitriol. Gil Scott-Heron was known for his establishment indictments. He consistently explored a complete spectrum of real political concerns in his songs and poems. He was known to be extremely timely, as many of his most popular songs dealt with social issues that if not burning were seriously singed at the time: South Africa under Apartheid, alcoholism, dysfunctional families, nuclear power plant hazard, political criminology as evinced in Watergate. He was most always on time. Show was his business. As it so happened one of his earliest efforts as a recording artists would be the title line of a poem that would stay associated with him throughout his career/life: “the Revolution will not be televised.” This line would be debated, thrown around, refuted and affirmed but its major action was to keep the concept, the struggle, the demonstration, the action in context and with goal. And perhaps even more importantly, he gave a McLuhanesque spin to looking at TV that a whole lot of people needed, since they would be the first generation (for the most part) to grow up under the influence of TV and therefore not a little absurd. The light box that mocked us with moving pictures and extensions of vaudeville and in rare instances with our own selves on it, was put together with the goal of containment and consumerism. We should have had better defenses and some did.. Whether the revolution would be televised or not -- to hear that concept was to internalize it no matter who you were, or how contained or consumed. The Last Holiday, a Memoir by Gil Scott-Heron came out almost exactly at the time he died. It was so impeccably timed as if it were indeed part of his show business. It deals with highlights of Scott-Heron’s life, especially the background for many of his most popular songs. Written in his own hand it is clear that he, the author of two previously published novels, and a couple of collections of poetry, was a writer well focused on what he wanted to say and how he wanted to say it. His prose is quite sharp and he is able to create nuance and humor at will. Therefore he contributes a fascinating vision of the life of a contemporary musician that is true and quite unlike what one might expect. While he did not become fabulously wealthy as is the stereotypical image of the “rock star” he gigged at some of the best venues often with some of the top stars in the business. His prime caveat, for whom the book is at least partially named, is one Steveland Wonder, who created almost single-handedly probably the last national holiday that is in honor of Reverend, Dr. Martin Luther King, Jr. And Gil was on hand on an extended tour with Wonder to personally witness this effort, the culmination of ten years of struggle. Scott-Heron covers highlights of his life - his childhood, most extensively, especially compared to the narrative pace of the rest of this memoir. He has journal type entries about touring within and without the USA with his various bands. He delineates his wives and the births of his children. The structure is intriguing and perhaps would only be possible in this age of texting shorthand and twitter feeds. It is almost as if he were outlining a biography to come. There are poems in this memoir, particularly dedicated to figures, be they Rev. Dr. King or Jesse Jackson, that are missing from his book of poems: Now and Then. Most of his best known lyrics are here: “Televised . . .” “We Almost Lost Detroit,” “Johannesburg.” and perhaps some other writings that are questionable as poems. It is, I suppose, an editorial decision whether the obviously add-lobbed introduction to several songs, as they appear on a CD of a live performance, belong as a preface to a poem/lyric with no distinction of design or type-face or lay out. Both the poems in the collection and the ones in the memoir mostly reflect rhyming couplet sequences he began with early on and apparently never abandoned. We will have to wait until there appears his complete poetry. It does seem from his memoir that he wrote certain observations, tributes and journal type pieces in that same rhyming couplet style— so perhaps there is more where that came from. I would hope that besides the planned re-issuance of his early novels would be even more prose and poetry from this brilliant figure in African-Americana.